Through daily readings and affirmations, the reader is led into an inspirational, experiential journey as seen through the eyes of a partner to someone suffering with Borderline Personality Disorder. Breaking Free from Boomerang Love progresses from the silent withdrawals to the exploding rages of the BPD, from the fearful, walking-on-eggshells to the ultimate healing and empowerment of the partner. The message is applicable to all relationships – lovers, family members, friends and work associates. 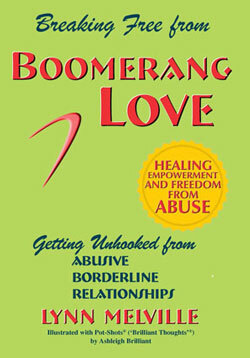 Boomerang Love describes how the partner of the borderline personality disordered person repeatedly leaves the relationship, only to return to it, again and again, desperately trying to fix an illness they don’t even know the name of – and which only the BPD can fix, with professional mental health help. Many books have been written by mental health professionals about borderline personality disorder. Boomerang Love is the first experiential book written by a partner about the disorder and the tragic ordeal of living with it. Poignantly illustrated with Ashleigh Brilliant's famous "Pot-Shots®", Boomerang Love is a book you will return to time and time again - to be uplifted and encouraged, or when you just need to be comforted. What Others are Saying About This Book . . .
As a psychotherapist dealing with borderline personality disordered people for the last 18 years, I’m thrilled to finally see a book written by a partner of BPDs for other partners. I’ve served as the online therapist for the Land of Oz Internet community board (landofoz@yahoogroups.com) for the past five years. I’ve seen literally hundreds, if not thousands, of partners post on this site, begging for information and support to help them deal with the pain and confusion of their relationships with BPDs. I’m pleased to now have Boomerang Love to recommend to them. It will be a lifeline to throw to them in their beaten-down despair. Lynn Melville’s book, Breaking Free from Boomerang Love: Getting Unhooked from Borderline Personality Disorder Relationships, is an excellent resource for someone who is caught in the cycle of violence. While not all abusers have a personality disorder, as Melville points out, the important thing is to focus on yourself, to ‘re-connect with yourself.’ This is the only way out of an abusive relationship, since we cannot change someone else’s behavior. Melville’s straight-forward approach to focusing on one’s self can be very helpful to anyone affected by an abusive partner. Thank you, thank you, Boomerang Love! Not knowing that I was really dealing with a personality disorder with my partner, I divorced him. I later forgave his behavior and took him back again … only to see the old painful relationship return, this time worse than before. Reading Boomerang Love allowed me to finally see that I could neither heal my partner, nor bear the pain of living with him, and I got out. When I was going through the ending of my marriage, I was sure my husband was crazy … or maybe it was I who was the crazy one. I read Boomerang Love 25 years later, and so many of the behaviors I could never understand became clear to me. I wish this book had been available to me and my children at the time of my divorce from their dad. We would have been able to understand that their dad couldn’t love my children or father them as they needed, because of his mental disorder. So much hurt and grief would have been avoided. I urge anyone who is dealing with a painful, abusive relationship to read this book. The tragedy is in expecting normal behaviors from someone who is so deeply injured that they cannot function with awareness of the suffering of another.